Today's adventure begins with catching a tiny passenger ferry across the harbour to Fowey's neighbouring village of Polruan. Make sure you pause to view the remains of the medieval blockhouse which was used to stretch a chain across the harbour entrance to Fowey in an attempt to keep out the Spanish and French. It's a stiff climb out of Polruan finally reaching the remains of St Saviours Chapel high above the cliffs before leaving habitation once again. 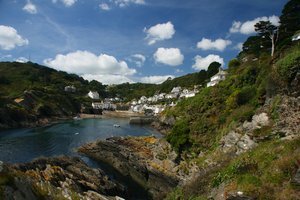 You now join a remote and wild coastline with some steep and impressive cliff paths to negotiate on the South West Coast Path to Looe. High above the golden sands of Lantic Bay you will gaze down with wild grazing ponies for company onto South Cornwall's most unspoilt beach. With the sun out and the colour clear azure sea its more reminiscent of the mediterranean than the coast of England. Protected by having no road access if you can make the climb down to the beach you won't forget it - a sensational spot, truly unspoilt, unchanged and unaffected by ugly side of the modern world. 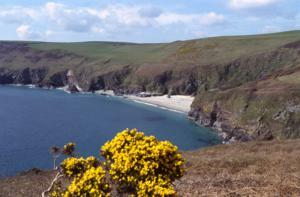 The Cornish Coast Path rises and falls along a classic section of coastline with not one house between you and Polperro. Lansallos Cove is another perfect inlet where farmers in the 18C cut an impressive passage way to the beach through the rocks to get carts down to the sands. 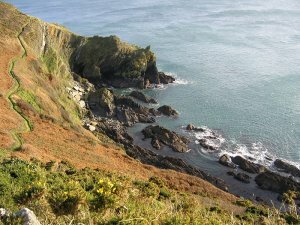 Climb past the white Daymark tower and negotiate your way down Raphael Cliff before Polperro harbour suddenly emerges from a ravine, making a convenient refreshment stop on the route to Looe. En route to Looe the path become more relaxed passing through pretty Talland Bay, a great place for a cream tea at the Beach Cafe - you can even hire a kayak here for an hour or so and paddle around this beautiful bay. A final few miles passing waterfalls and rolling pastureland that includes the remains of the Chapel of Lamanna built by the Glastonbury monks and these days for coast path walkers marking the entrance into Looe. The final mile is along the seawall at West Looe but with great views out to dominating St Georges Island just offshore, a fascinating place now uninhabited that was home to the Atkins sisters who doccumented life on the island in several books. You can visit the island by boat from Looe - further away if visibility is good enough you might even catch site of the infamous Eddystone Lighthouse 14 miles out.